Do you fully understand lone worker policies & standards? Lone workers have certain policies and standards in place to protect them from the large number of risks they're exposed to. These policies may be confusing and hard to follow leaving your business at risk of not following the laws. 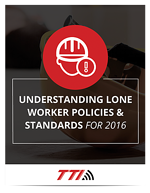 To find out more about what you NEED to be doing to create safest possible environment for all of your lone worker employees, download the free eBook "Understanding Lone Worker Policies & Standards for 2016 " today.